All along the Delaware River, derelict industrial sites are being transformed by the Philadelphia Parks and Recreation Department and the Delaware River City Corporation into a string of waterfront parks interconnected by trail extensions that will become part of the East Coast Greenway. In the Bridesburg neighborhood, SITIO, in collaboration with Langan Engineers and Ground Reconsidered, recently unveiled the design for a new 10-acre park to the community. SITIO’s design for the park’s pavilions - to include a performance stage, a picnic pavilion, restrooms and way-finding signposts - found inspiration in the brawny infrastructure and industrial character of the bridges and structures that surround the sweeping waterfront site. 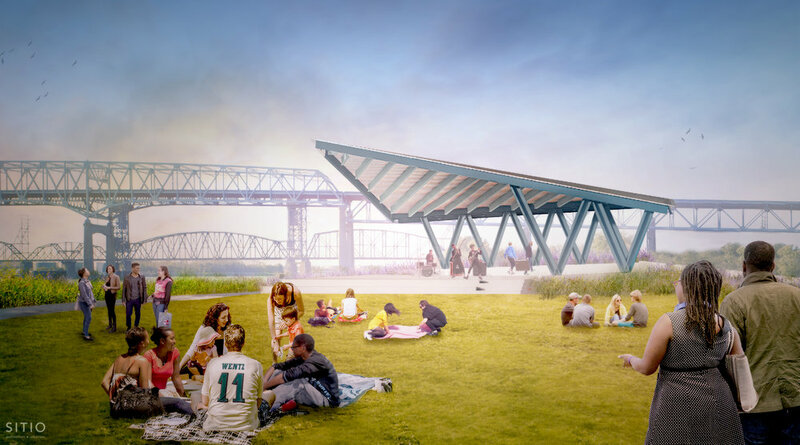 The creation of this large Park will also feature event spaces, terrace seating, boardwalks offering sweeping views out into the waterfront, and connections to the Richmond and K&T trails to the north.